The Germans are taking life under the bubble to a whole new level thanks to Malaysia while Angela Merkel is busy working for the Empire foreign affair. 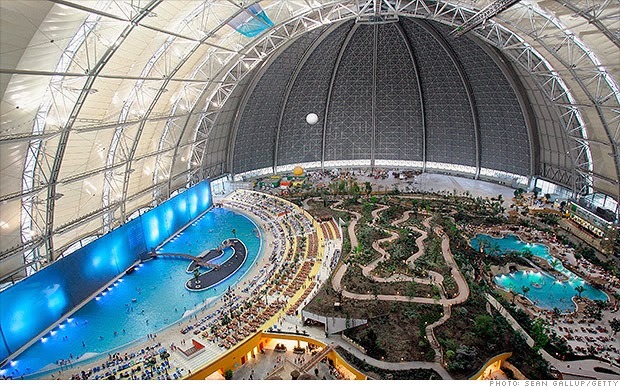 In 2004, a Malaysian company turned a large hangar originally meant for airships (think blimps) into an indoor tropical paradise just outside Berlin. The hangar -- larger than 10 American football fields and tall enough to fit the Statue of Liberty -- was built in 2000 to house airships designed to carry extra large pieces of cargo. When that company went bankrupt, the Malaysian firm took over. Now the hangar hosts a lagoon, a 600-foot long beach, the world's largest indoor rainforest (with a half-mile hiking trail), a spa, bars, restaurants and a 198-room hotel, among other other things. Parts of the roof have even been modified to let in ultraviolet light, allowing sunbathers to get a natural tan. It will be even better if this hangar was transformed into mass food production zone instead of entertainment of the same purpose as UN Agenda 21, but people will realise one day what they take for granted.